Melatonin is a naturally produced hormone that is secreted by the pineal gland located at the base of the brain. The purpose of Melatonin is to help regulate sleep and allow the body clock to achieve a natural rhythm thus enabling the individual to sleep at the right times and maintain a healthy amount of energy whilst awake. As an individual ages so the levels of melatonin produced begin to decrease which is why as you get older you need less sleep. However this can sometimes be caused by conditions such as Fibromyalgia or M.E (Myalgic Encephalomyelitis) and can leave the individual feeling lethargic or chronically fatigued. Serotonin again is a naturally produced hormone which moderates moods, emotions and appetite. This hormone can also be affected by conditions such as Fibromyalgia and M.E (Myalgic Encephalomyelitis) which is why many sufferers of either condition find that their moods can change erratically as well as their desire to eat and sleep. As we have already mentioned, these two conditions can cause a devastating effect on the amount of both melatonin and serotonin that an individual produces. It is devastating in as much as the sufferer may find they are suddenly very tired without warning or unable to relax. The sufferer may also find that they are susceptible to wildly varying mood swings which can leave them suffering from mild through to severe depression. Should you be suffering from either Fibromyalgia or M.E (Myalgic Encephalomyelitis) you will doubtlessly have suffered from some of the symptoms we have mentioned. Lack of sleep and loss of appetite are very common and are closely followed by difficulty controlling ones emotions and depression. We have discussed previously how there are no cures for Fibromyalgia or M.E (Myalgic Encephalomyelitis) but how overlapping conditions can be treated to some extent. This is the case with pain, depression and inability to sleep and there are a range of prescription medications that your doctor can prescribe for you once he or she is convinced they will be necessary. 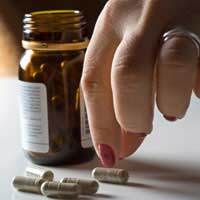 Your doctor may also prescribe supplements that will help replace melatonin and serotonin that has been lost through these conditions or he may suggest an vitamin supplement that may help instead of prescribing medications which could become addictive if taken over long periods of time. There are herbal remedies available that can help replace lost melatonin or serotonin but as always we recommend you consult with your doctor before embarking on any such courses of herbal medication. In addition there are foods that contain melatonin and serotonin naturally which can help to combat the lack of these hormones in the body. An appointment with a dietician is best to discuss what changes can be made to your diet and indeed what foods will help or hinder the production of thee hormones. From a personal viewpoint trying to relax and relieve stress can also increase the levels of the hormones produced and endeavouring to undertake some light exercise may also be beneficial. However it should be stressed that if your condition - either Fibromyalgia or M.E (Myalgic Encephalomyelitis) - is the chronic variety then light exercise should be undertaken only after consultation with your doctor.